RFID Tracking - Asset Management Solutions by Bar-Scan, Inc.
Bar|Scan, Inc. can provide a total desktop asset management solution. Contact us and ask us how we can meet your RFID requirements. From off-the-shelf to custom installations, from single warehouse to enterprise level installations, we have the resources to successfully implement your RFID tracking system. Because of the many facets involved with an RFID installation, we can assist you in the development of your implementation requirements. Please contact us for more information. Bar|Scan can meet your RFID tag needs. Based on your application requirements, you can choose from a number of different encapsulation and mounting options. 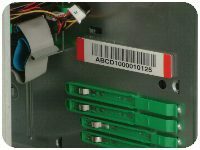 Labels can also include barcodes, in both UID and traditional formats.